Mountain, Sport, & Health will offer an updated panorama, from laboratory experimental studies to the application on day to day practice, on different topics related to mountain sport activities and their impact on human performance and health. 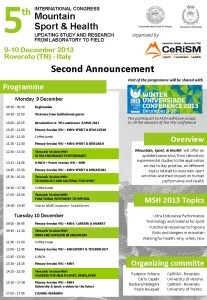 The programmeof the MSH 2013 will be shared with Winter Univerdsiade conference 2013. The registration will give access to both MSH 2013 and WU conferences. Please check “Rovereto (09/10 December – International Conference on University Sports: Inspiring Innovation)” under LOCATION in the booking page. Travel information Located in the northern of Italy, between the Garda Lake and the Dolomites, Rovereto can be reached by train (www.trenitalia.it) or by car (A22 Highway). The airports nearest to Rovereto are Verona (90 km), Venezia (125 km) and Milano (245 km). Rovereto is a small and nice city, mainly known for its history and for actual cultural events. Placed on the Adige Valley, Rovereto can be shown as one of the entrance doors for the Alps and Dolomiti and its new, internationally known, Modern Art Museum building (MART) will host the Congress.